Printed using professional quality ink and photo paper, this 8.5 X 11 inch print will add a touch of whimsy to your room. I love owls and this one is too cute! 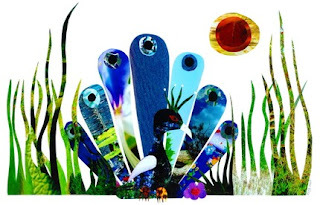 Beautiful shades of blue come together to create this peacock collage. 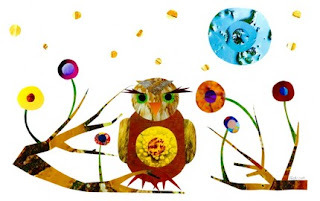 Also 8.5 X 11 inch and made from the same quality products as the Owl with Flowers collage, these prints will resist fading for 100-115 years! So whenever you are able to get the senior discount at Denny's your photo will still look the same! 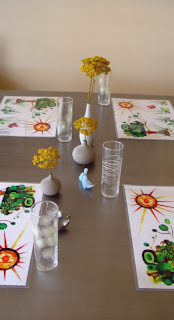 Featuring Elisa's Meadow collage this placemat is thermally laminated using super thick 10 mil laminating films. It measures 11X17 is made from 10% recycled materials and is 100% easy to clean with soap and water. Each of the placemats on Wing and Willow is listed separately so that you can mix and match the designs as you desire. 1. Check out Wing and Willow's Etsy shop and come back here and rave about one of the items. Best of luck to everyone! Entries will be accepted until midnight Friday. I would also like to say congratulations to Elisa! Something very special happened to her this month-she got engaged! Cool Shop! 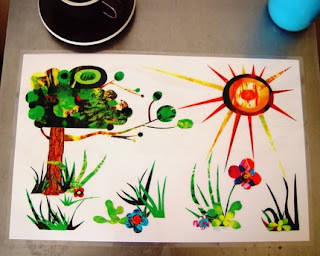 Those collages remind me of the very hungry caterpillar! Ooh cute! I love the colors on that meadow placemat. How cool are the place mats.. I love the bright colors..